Mortgage rates are rising, up nearly 1 percent since mid-October. Tomorrow, rates could rise again. The Bureau of Labor Statistics releases the November jobs report at 8:30 A.M. ET Friday. With a stronger-than-expected reading, mortgage rates should continue their climb, harming home affordability nationwide. And already, Wall Street is bracing for big results. Here’s why. 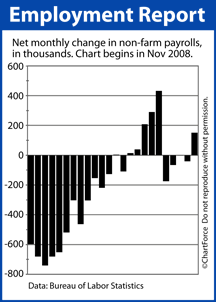 Wednesday, payroll processor ADP said that 98,000 private-sector jobs were created in November. The figure was a complete blowout reading as compared to analyst estimates, which had the results in the 50,000 range. But that wasn’t all. ADP re-measured and re-reported October’s gains, too. It found that 84,000 jobs were created — not the 43,000 on its original report from 30 days ago. If jobs growth is the keystone to economic recovery, the ADP report suggests that recovery is already underway. It’s bad news for rate shoppers. A faltering economy helped keep mortgage rates low. A recovering one should make rates rise. And, that’s exactly what happened Wednesday. In response to the ADP report, conforming mortgage rates posted their third-worst day of the year. Rates climbed as much as 0.375 percent throughout the day as lenders scrambled to keep up with a deteriorating market. At some banks, rates changed 4 times between the market’s open and close. Tomorrow, analysts expect the government to report 146,000 jobs created in November. Mortgage markets and home affordability have a lot riding on the actual results. A lower-than-expected reading should lead mortgage rates lower. Anything else and mortgage rates should rise. Likely by a lot. Therefore, if you’re shopping for a mortgage right now, or floating a loan that’s in-process, think about your personal risk tolerance and whether you want to gamble against rates moving higher. Once Friday morning’s report is released, it may be too late to lock something lower.